I’m thrilled to shine the spotlight this month on the really fabulous textile designer Eva Sonaike. I first came across her work on Instagram and requested some fabric swatches and when they arrived they came in a beautifully presented box , which I opened to squeals of delight! Her colour palette is spot on for me and I love how she is playful with African tribal prints making them feel so fresh and contemporary. They look so right for today’s maximalist interiors. As a designer there is plenty to be inspired by. Her career path into design is fascinating as is how she methodically plans for her business and juggles her family life. 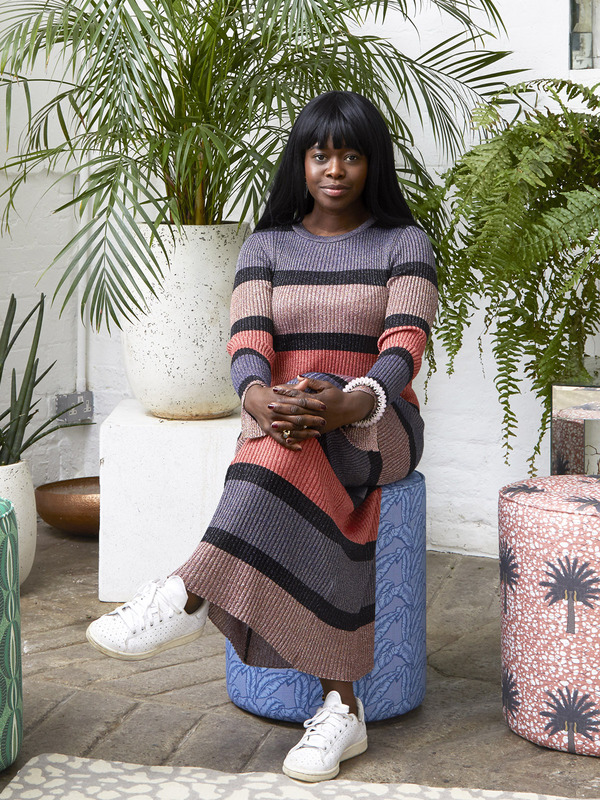 With her designs moving into rugs and soon to be wallpapers she is definitely one to watch! You started your career in journalism, how easy was it to make the transition into a new business? After graduating from my BA in journalism, I started my career in TV and worked for a German lifestyle TV show as their London, Paris and New York correspondent, covering trends in fashion, music and the arts. But I always wanted to work in print journalism and specifically in fashion, so I went back to university in 2005 to do my MA in Fashion Journalism at the London College of Fashion. This was followed by 6 years as UK Fashion Editor at Instyle and Elle German here in London. I think my experience in TV and the fashion world gave me a great foundation and understanding of how brands work, a great visual sensibility and a desire to be my own boss and create a legacy. These are all elements that helped me immensely when starting my brand. But at the same time, I wasn’t at all aware of how difficult, time-consuming and nerve-wracking it could be to run your own business. Which in hindsight was great, because I just did it without knowing what I let myself into. What advice would you give someone looking to embark on a change of career? The most important criteria, in my opinion, is to have a passion and burning desire for what you want to branch into. I was and am still obsessed with colourful interiors and African fabrics. I can’t stop thinking and talking about it. But at the same time, you have to have a structure in place. A strategic way of how you want to build and grow your company/idea and a step by step plan on how to achieve this. I always think at least 10 years ahead and plan everything out year by year and follow this plan as well as I can. And depending on your circumstances, it is also very important to have some savings, as you may not see a financial return for some time and you still have to eat. 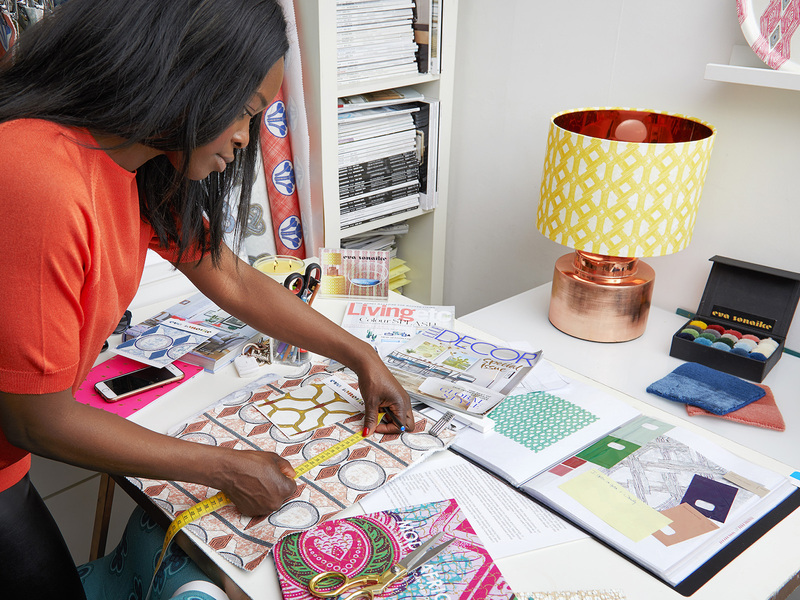 You have made a career from your love of colour and pattern, what sparked your passion? This passion has always been there. 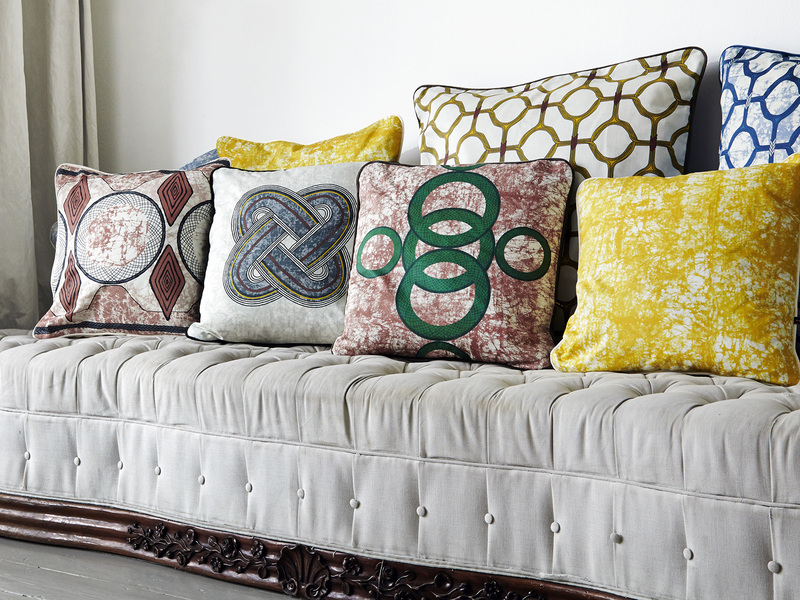 From an early age, I was obsessed with fabrics and texture and especially interior design. I grew up in Germany and my parents are both from Nigeria, West Africa. Art and culture have always been a very important aspect of my family. My parents were both very much involved in the art world with my Dad being an art historian and my Mum being an art collector. So growing up I was surrounded by art and we spent our holidays visiting museums, historic buildings and heritage gardens. Despite finding this all very boring as a child, the appreciation and love of art and design were manifested in my life and I can now enjoy and utilise it in its full glory. So I initially though fashion would be the right career path for me. 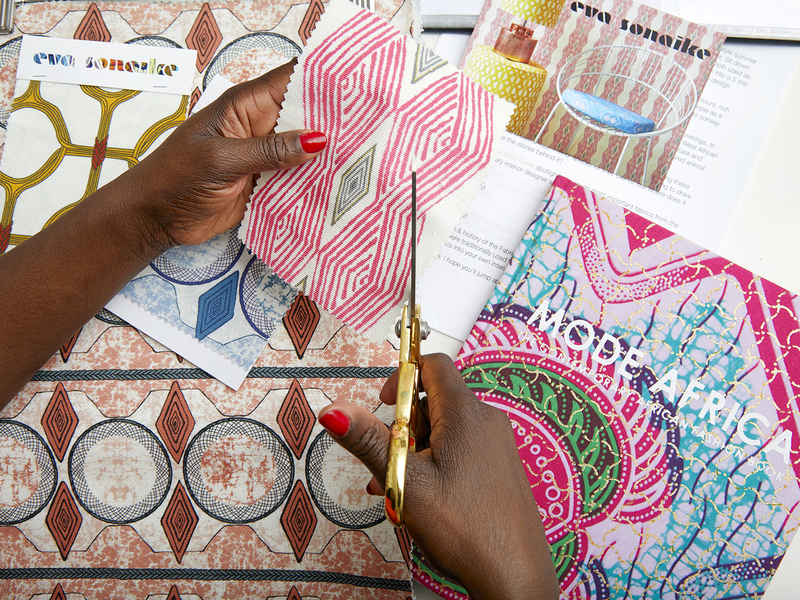 But after working in fashion for many years, I realised, that my true passion was in interiors and African textiles. So I combined the two and here we are! You have both African and German origins, which you take inspiration from, how easy is it to combine both aesthetics into your work? I think my work really reflects who I am. I am Nigerian, born and bred in Germany. And I was lucky enough to enjoy and celebrate both cultures equally. Many people say that my work is not typically West-African, but translates into both African and Western cultures because of its contrasting elements and clarity. Can you tell us about your process from finding inspiration through to turning it into a fabric or product? I have all my designs stored in my head. There is enough material for designs and patterns for the foreseeable future. But translating this into collections that are commercially viable and tell a story, takes me a long time and requires a lot of thought, planning and effort. I am normally the most in tune with my creative side when I travel in West Africa. The impressions, colours, sounds textures bring out so many ideas in me. So I always have a pen and paper and my iPhone on me, so that I can capture everything that inspires me. The first stage of my design process is always the colours. My collections always consist of designs in multiple colours, so I start with choosing the colour palette in very much detail. Once this is finalised, I think about the story I want to tell, which is always related to something that inspired me on my travels in West Africa. I then draw and develop the designs that relate to this particular story (all by hand with a pencil), which can take a long time, as I will only finish once I am 100% happy with the end result. Then I send everything to the printer and there are aways at least 3 to4 changes until everything is ready to be brought to market. Applying the designs to our finished products is relatively straight forward. We currently have cushions, fabrics by the meter, make-up bags, pouffes and rugs in our product offering. And all fabrics are set to work with these products. The most recent addition to your portfolio is a rug collection. How did this range come about and why? I absolutely love rugs. When I was in secondary school in Germany, my best friend’s parents had a rug shop with the most amazing Persian rugs. We used to play hide and seek in there and jump and climb on the piles of rugs. I swore to myself back then that one day I will work with rugs. In the beginning, I only focused on the cushions and fabrics, but as my confidence int he business grew, I thought it was time to add rugs. 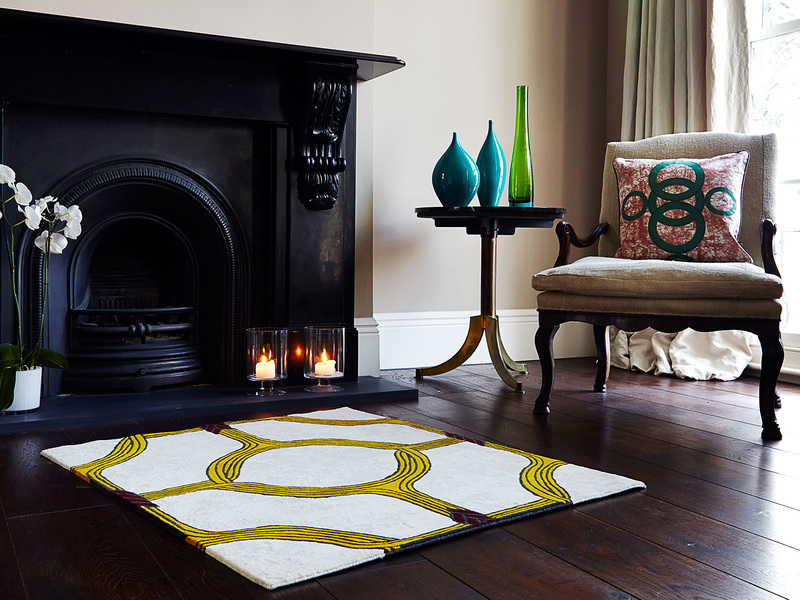 The rugs are made in Nepal by adult artisan and we work in collaboration with GoodWeave who guarantee ethical working conditions for all the workers and their families involved in the rug making process. My days vary, depending on the season. January to March and August to October are traded buying seasons, so when we return from the trade shows in London (Decorex) or Paris (Maison & Objet) we work mainly on sales and production. Christmas sales for our e-commerce site and Christmas s fairs usually also starts in late October. Whereas summertime is often quieter, so I focus more on product and business development and designing. Interior design projects run through the year but are often long term-projects, so we may quote and supply information over a longer period. But a typical day for me starts at 9 am after I dropped my kids to school. I usually spend the first 45 minutes of the day going through emails, checking my accounts and budgeting and fine-tuning my plan for the day (I am a planning addict and always make the weekly plan on Friday afternoon the week before). My team arrive at 10 am and we normally have a 10-minute discussion over a cup of tea of what we are planning to accomplish on the day. I then usually divide my day into sections and work an hour on sales, an hour on marketing and an hour on business planning and development, all depending on the season and what we are working on. Before lunch, I have half an hour with my team to discuss our progress and bounce ideas and questions of each other. We often have meetings with interior designers, who either come to the studio or we meet them in their offices in central London to show them samples and discuss bespoke orders for projects. I am very bad with my lunch routine, so I often have a quick salad and tea at my desk for lunch, whilst checking Instagram or reading the news on Huffington Post. Not good, but I am always pressed for time. Our US showrooms are an integral part of the business, so we usually check with the girls over there after lunch whether they need any samples or further product information for any of their projects from us. And then it is back to emailing people and answering the requests and enquiries from our clients. I usually leave the office by just before 4pm to collect the kids from school and then either drive them to their various extracurricular activities (where I manage my emails and calls from the car) or head back to the office for another round of emails and checking with the girls in the studio on updates about their tasks. We try to always have an early family dinner, and then I am off to my hot yoga class in the evening three times a week, where I let go off all my thoughts and plans and focus on my soul and wellbeing for 75 minutes. Then it is home, shower, journal, pray and sleep. What’s next for you in terms of your career or upcoming projects? As a business owner, you are constantly evolving. I am not the same women I was 10 years ago when I started this, nor the woman I used to be last summer. I think it is very important for any entrepreneur, to constantly work on your personal growth in order to grow the business. But philosophy put aside, in terms of business, we are currently working on our first wallpaper line, which I am really excited about. You can finally have a piece of Eva Sonaike on your walls! And there is a new product, we are currently developing. 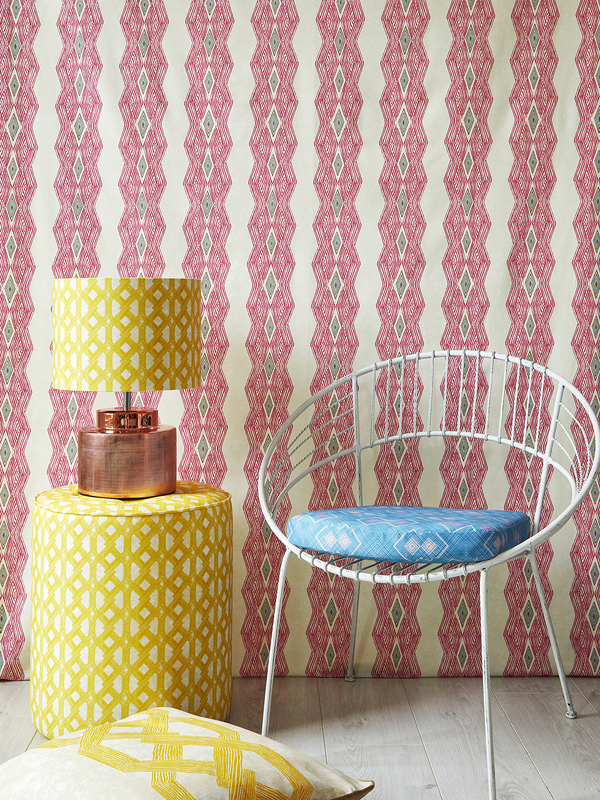 I can’t say too much about it at this stage, only that it will be a very subtle, yet colourful range that can be easily combined with all our existing patterns and designs. All in all, I am very excited about our future and feel super blessed and grateful to be able to do what I love! The post Designer Spotlight: Eva Sonaike appeared first on Sophie Robinson.